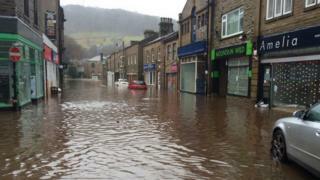 Grants of up to £100,000 are to be made available to support business in West Yorkshire hit by flooding over Christmas. The West Yorkshire Combined Authority has agreed a total business flood recovery fund of £5m. It said grants could include cash to repair or buy new equipment, pay to restore flood-hit premises or help with relocation costs. The fund will be managed by the Leeds City Region Enterprise Partnership. The money will come from the area's regional growth fund allocation from the government for 2016/17. The city region area covers the 10 local authority areas of Barnsley, Bradford, Calderdale, Craven, Harrogate, Kirklees, Leeds, Selby, Wakefield and York. It is believed around 2,000 businesses were damaged by the flooding in December. Peter Box, chair of the combined authority, said: "I know how devastating it has been for many small and medium businesses and the knock-on effect for those companies that are suppliers or customers of those flood-hit firms." Mr Box said he accepted the money would only "scratch the surface" and said the combined authority would continue to press for continuing support for flood prevention measures from the government. He said the grants, which would range from £5,000 to £100,000, would be in addition to financial support already offered for flood clean-up costs by local authorities.